Originally his dad’s tractor, bought off the line in 1946. Bob’s dad traded it in 1958 for a new tractor. In 2014 Bob’s bulk fuel man found the tractor about 60 miles from their homestead in South Dakota. Bob went and pulled it from the field, and restored it back to original. This picture was taken in 2017 completely restored with many STP parts. 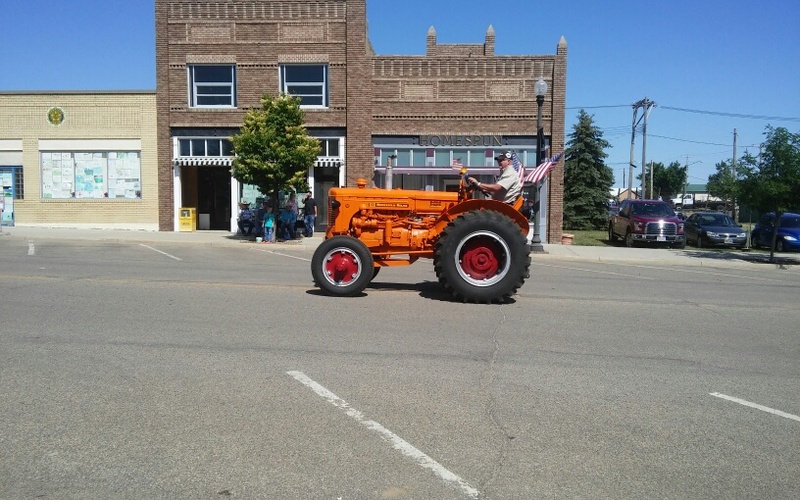 The South Central Threshing Bee located at Braddock, North Dakota is featuring my dad’s once owned Minneapolis Moline UTI tractor in honor of the Minneapolis Moline farm equipment manufacturer this year. This annual event is scheduled the first weekend after Labor Day. The attendants paid, right to entry badge will serve as a two day pass to this threshing event which is featuring this unique restored MM-UTI’s picture on the badge. The SOUTH DAKOTA magazine printed and published at Yankton, South Dakota under the editor-ownership of Bernie Hunoff, is including tractor pictures and a story about the history and accomplishments of this MM-UTI tractor. Read other stories about Minneapolis Moline tractors here, and shop for parts for your MM tractor at Steiner Tractor Parts, Inc. Tractors are like family sometimes and it’s nice when you can find an original tractor that was once yours and bring it home again. Your tractor came out looking nice and hopefully will remain in your family for good. Congratulations!